It’s finally here, the One Room Challenge reveal day! 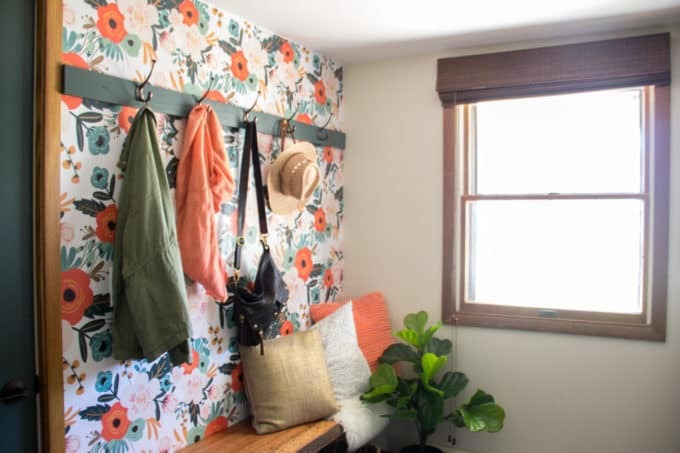 This was my fourth ORC and this time I decided to makeover our mudroom. In case you weren’t following along over the last six weeks, here’s a picture of the mudroom “before”. It was stark, bland, and didn’t have much storage. After only six weeks now we have this beautiful mudroom to come and go from. 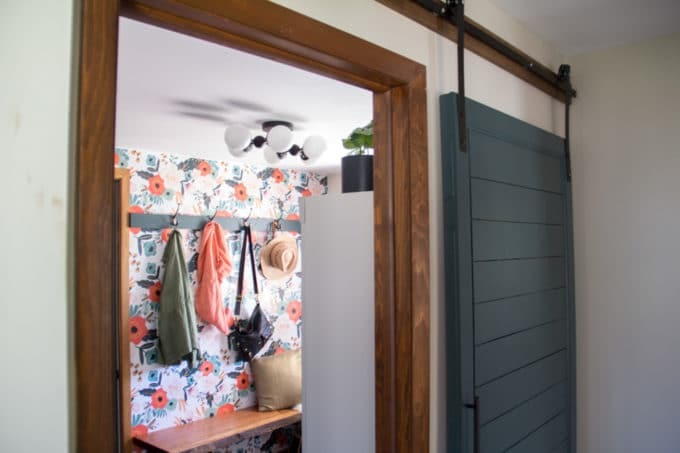 I’ll start by talking about the barn door into the mudroom. 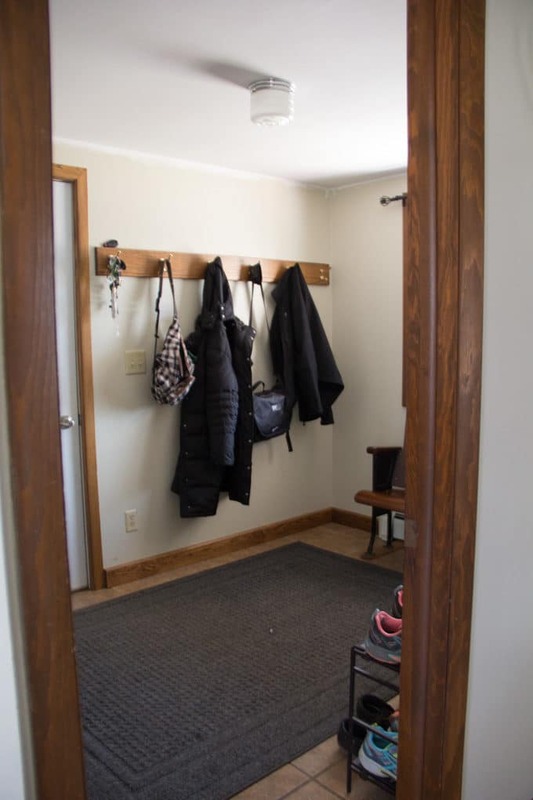 When we moved in the mudroom had a swinging door that was always getting in the way. After taking it down I realized that it would be nice to have a door to close occasionally when the mudroom mess gets out of control. I built this barn door using my tutorial that I wrote a few years ago. 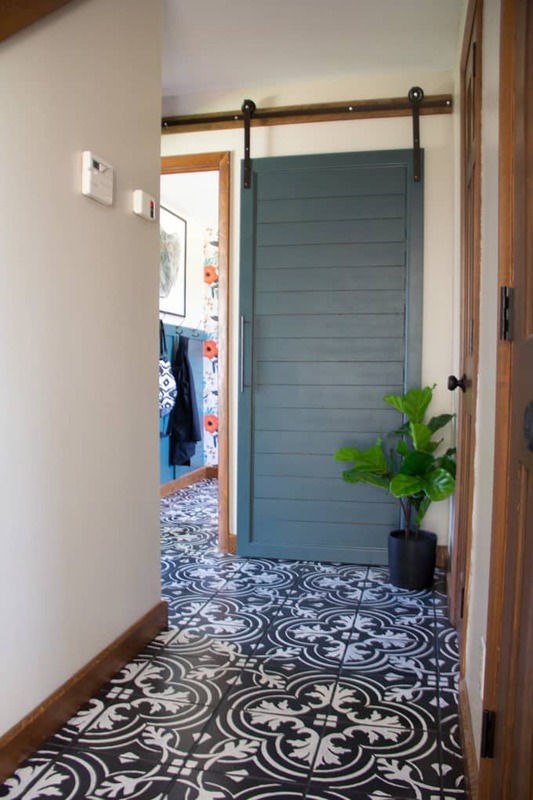 Ok, now let’s talk about the real showstopper here… those cement tile floors. 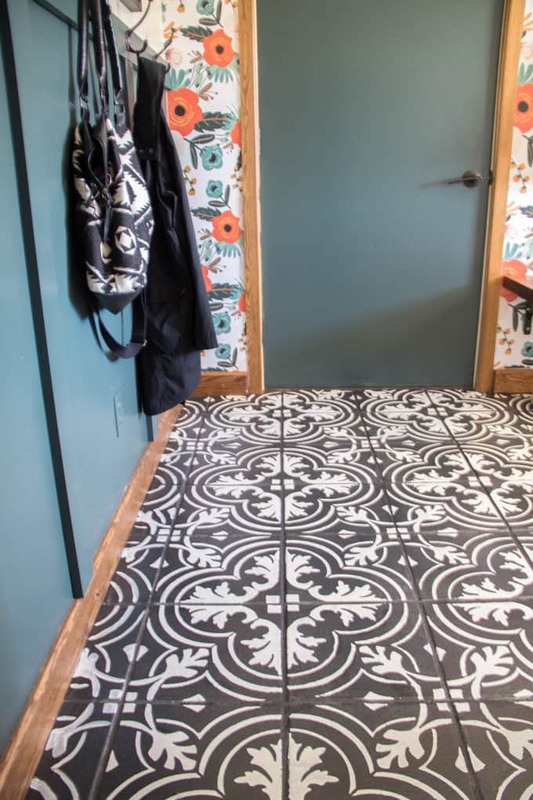 Actually they’re not cement tile, they’re stenciled and painted floors! 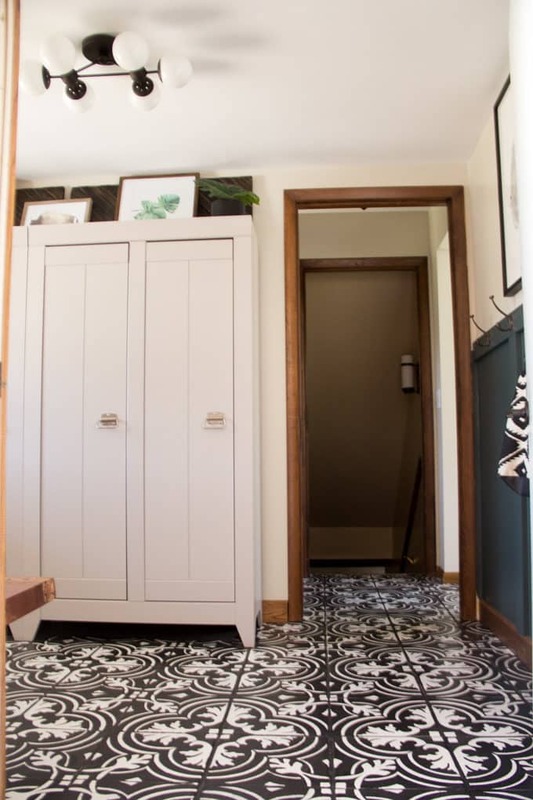 I shared the entire tutorial here, but yes, I painted our peach tile floors. 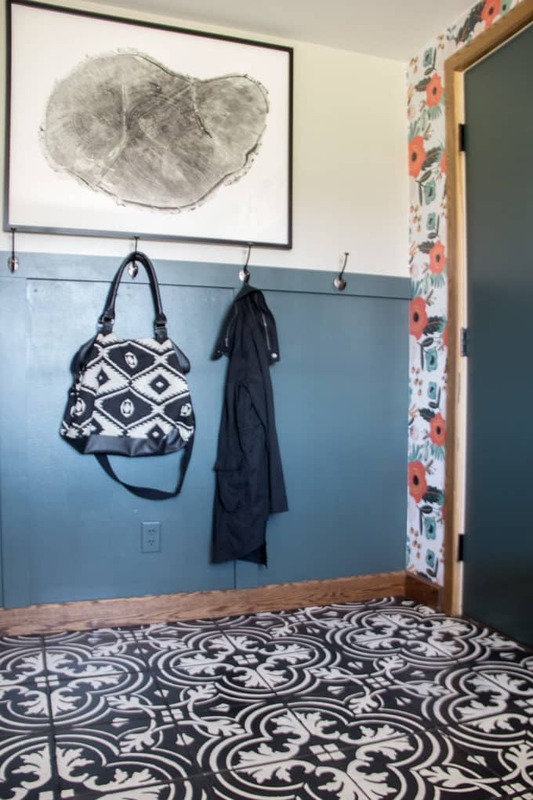 I know it’s a bit of a pattern overload, but I LOVE the way the stenciled tile looks in the hallway, and most of the time we will probably have a rug down in the mudroom. I like how a rug traps the dirt and seems to keep it from tracking throughout the rest of the house. Another new addition to this room is this amazing live edge wood bench from Rockler Woodworking. 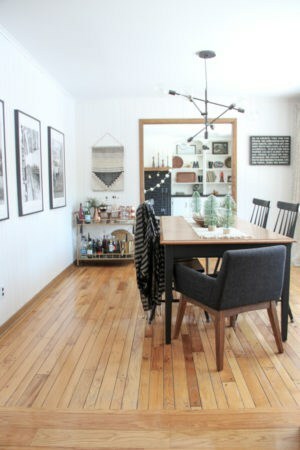 I’m loving it’s rich wood tones and the element of nature that it brings into the room. I also love that we have a solid place to sit for putting on and taking off shoes. Let’s be honest… it also makes the perfect “time out” bench. This room is filled with show-stoppers and this light is another one. It’s the Euro Metro Ceiling Light from Lamps Plus. It was really hard to find a flush mount light with character and this one is amazing. It’s modern, has character, and it won’t be in my tall husband’s way! Another show stopper is this amazing wallpaper. 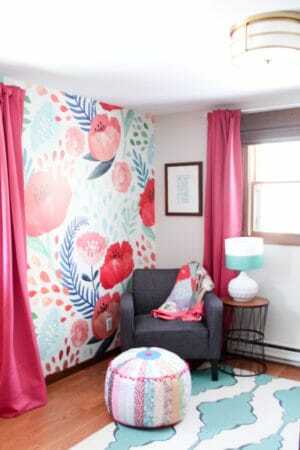 It’s the Juncaceae removable wallpaper from WallsNeedLove. 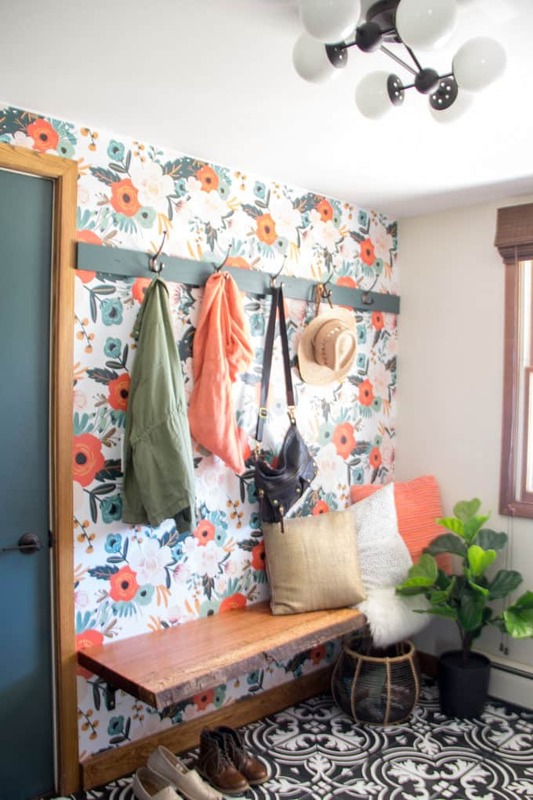 Typically our house isn’t filled with this much color or pattern, but I feel like a mudroom is a fun place to do something a little more wild! 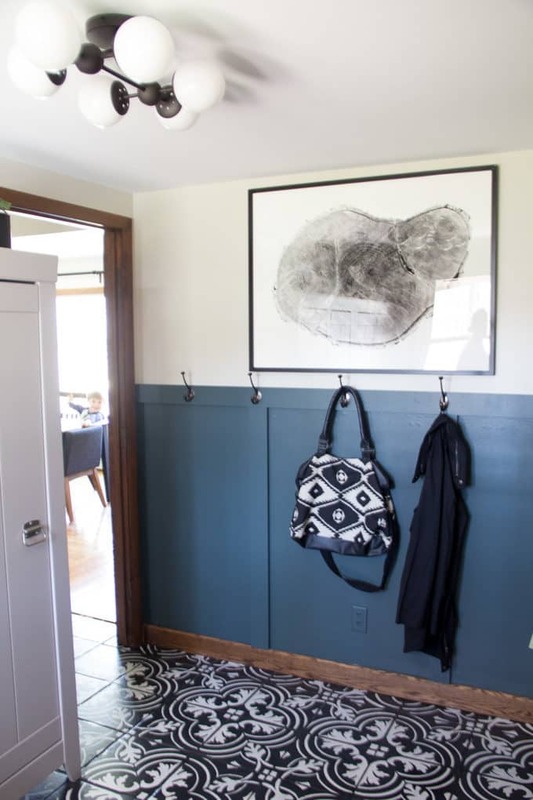 We also outfitted the mudroom with this bamboo shade from Blindster. These blinds are my absolute favorite and they function SO well. These Pilltop two prong coat hooks from D. Lawless Hardware provided all the hanging storage that we need. We created a space for adult coats and bags, and a place for kids coats and bags. 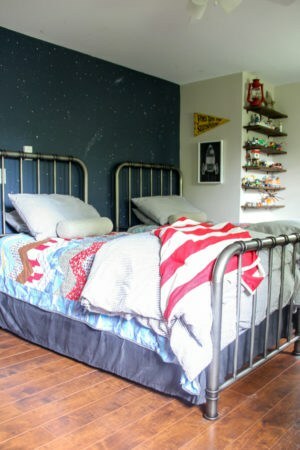 This deep blue/green color is Benjamin Moore “Hidden Falls” and I have been using it in small doses all over the house. This tree ring art from Minted is another favorite. Our house is nestled in the woods and I love the element of the outdoors that it brings in. I also love how it works with the live edge bench and natural woodwork throughout our house. Do you see my little photo bomber working in the dining room? I didn’t notice him until I was editing these pics and I wasn’t going to re-shoot! 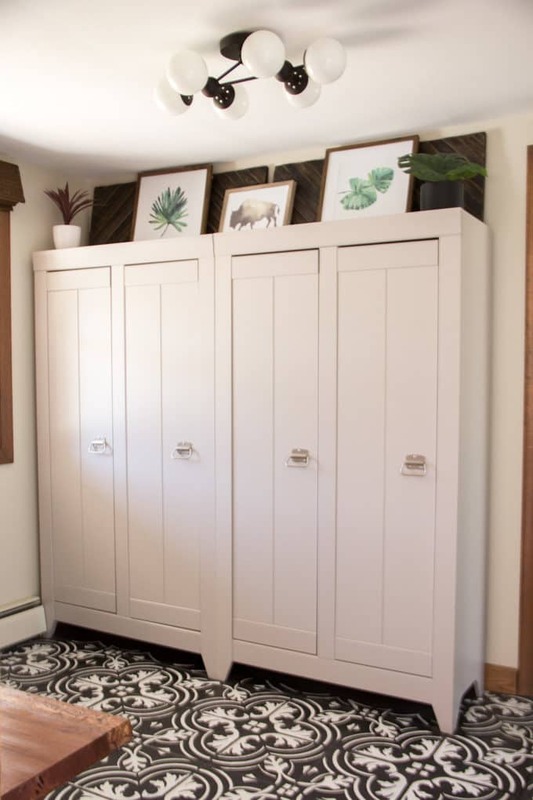 Over on the other side of the mudroom we installed two of the Adept wide cabinets from Sauder. 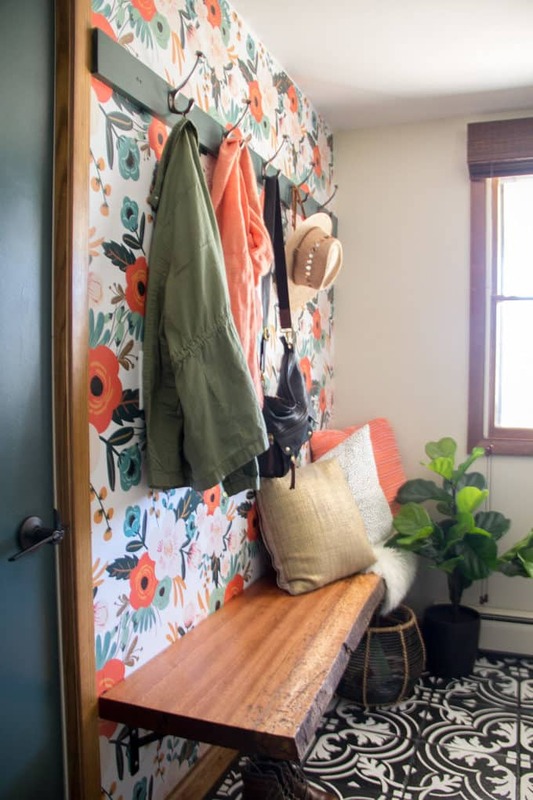 These locker cabinets solved all of our storage dilemmas, and also look great. I staged above those cabinets with some art and plants that I picked up from Target. Here are the links to those pieces: Purple Plant, Wooden Art, Single Leaf Print, Buffalo Art, Double Leaf Print, Palm Plant (discontinued but similar). 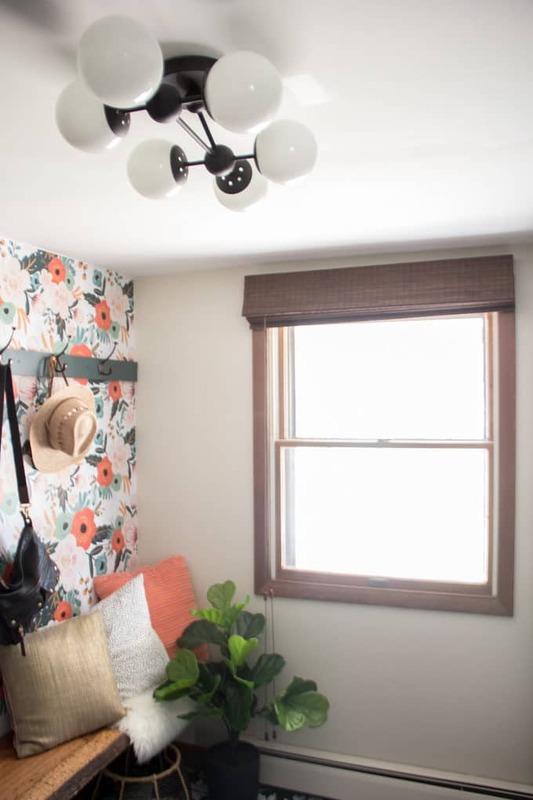 I am SO happy with how this room turned out! 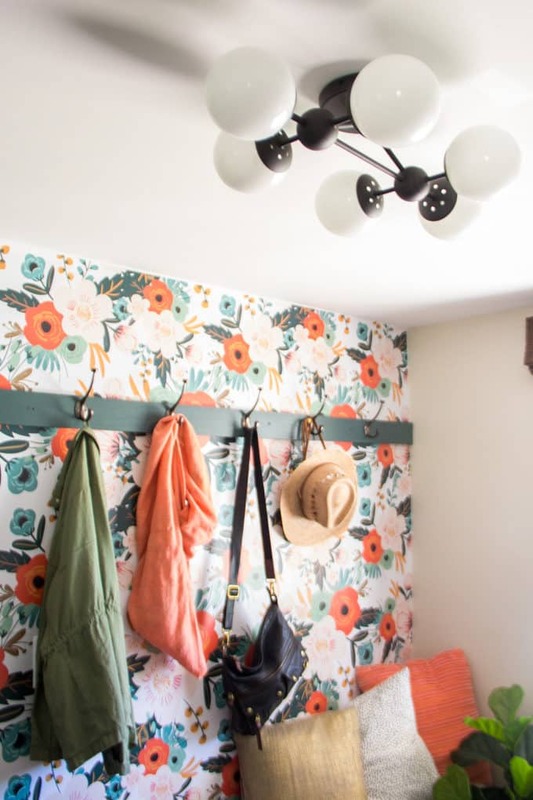 Now rather than being greeted by bland walls and piles of shoes we’re greeted by this fun and inviting space. 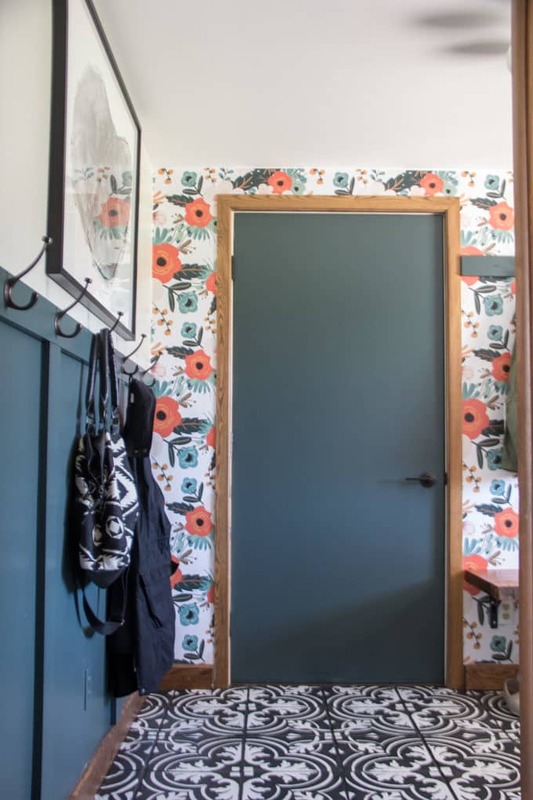 I went into this challenge with this mood board, and the floral wallpaper was a late addition! I absolutely LOVE the way it all turned out. 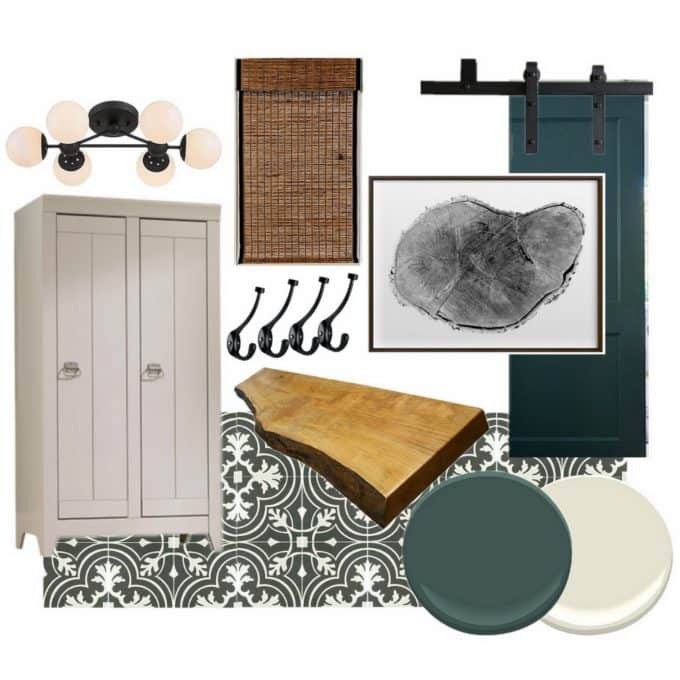 If you’ve got a space that you need help decorating, make sure you check out my e-design services and other mood boards. Thanks a ton for following along with this makeover! I am so thankful to the sponsors of this space: WallsNeedLove, Lamps Plus, Rockler, Blindster, D. Lawless Hardware, Amy Howard, Minted, and Sauder. Without them, this room and blog wouldn’t be possible! It’s wonderful!!! 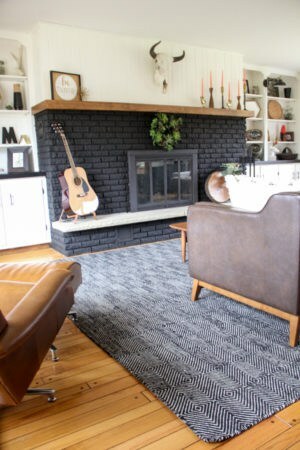 Love the flooring and your styling is so YOU! Eclectic and welcoming!!! Aw thank you friend! It really does feel like my style. It’s so much nicer to come home to now too! 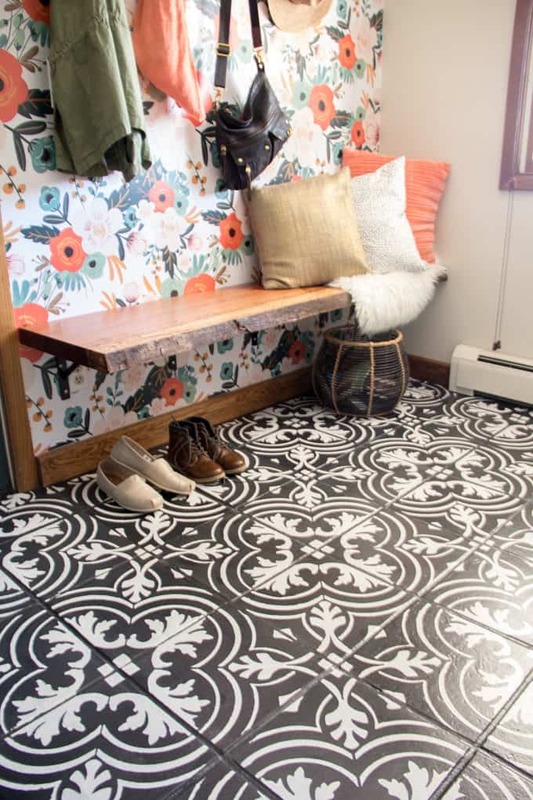 I just love how your stenciled floors came out. 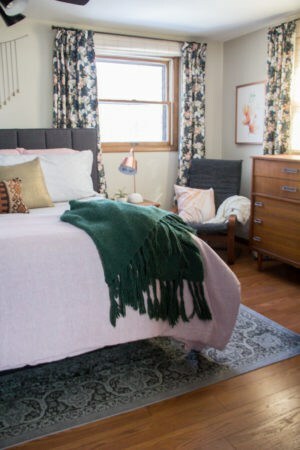 I adding it to my Surface Design group board on Pinterest, b/c I would love to try it on one of our properties someday. Also, love that color green that you chose for the door. It came out great!